Now you can proudly show your allegiance when your battlemechs stride into combat with Gale Force Nine’s ALL NEW Mechwarrior Dice! Each package contains three (3) dice molded in appropriate faction colors with the faction clan symbol engraved in place of the “six”. 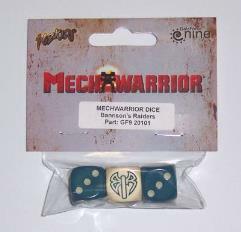 Specially designed for use with Wizkids’ Mechwarrior collectable miniature game, one of the three dice in the pack is inversely colored from the other two.